The first in a two-part series on electrocution hazards, MARCOM's Electrocution Hazards In Construction Environments PART I… Types of Hazards and How You Can Protect Yourself Construction Safety Kit discusses the major types of electrocution hazards, and how employees can protect themselves from electrical hazards and electrocution in construction environments. There are a number of causes of shock, electrical burns and electrocution. If the power to electrical equipment is not grounded, the grounding path has been broken, or there are live parts or bare wires, a fault current can travel through your body. Even when a piece of equipment or a tool is properly grounded, it can instantly change from safe to hazardous because of extreme conditions or rough treatment. So employees need to know what hazards to watch out for and how they can protect themselves. 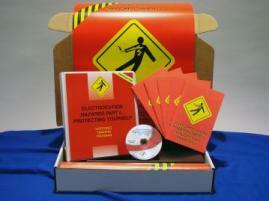 Materials in the kit include a DVD program, a compliance manual, five motivational posters, and 30 employee booklets. Topics covered in the DVD program and employee booklets include electrical hazards and electrocution, major types of electrocution hazards, power lines and GFCI's, power tools and extension cords, lock-out/tag-out and more. The posters in the kit emphasize the importance of working safely around electrocution hazards. The DVD program in the kit comes with a comprehensive leader's guide, reproducible scheduling & attendance form, employee quiz, training certificate and training log.